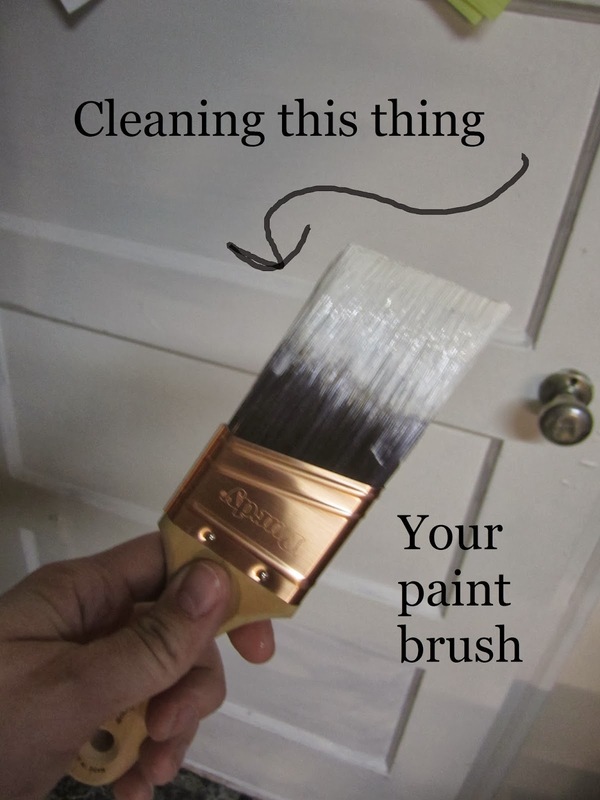 That pesky paint brush - How to clean it. I've started a painting project in my kitchen this week. It will probably take me fore ever to finish at the rate i'm going, but it will look really great by the time i'm done. My Counter tops are a really pretty deep green marble, but we painted the walls a few years ago a dark moca color. It seemed like a good idea at the time, but it makes our small kitchen even smaller. So, when I'm done, it will be a really pretty Orange Confection with Swiss coffee trim and Peanut Butter accents. It all goes great with my counter tops. I'm super excited. Since it's going to take me a long time to paint. I'm going to have to clean my brushes many times. I found these easy steps to clean the brush and keep it soft when it drys. I tried it out today on my brush and although it is still wet, I noticed that the paint came out of the hairs easier and faster. Here is what I did. Soak the dirty brush in a cup of hot water. I would suggest using one you don't mind having paint in, just in case it doesn't come out. Such as my "Lots of Love," mug that I've never used and don't even know why I keep it. Let your brush soak for an hour or so, then rinse it under hot water till the water runs clean. This shouldn't take too long. Put the brush back in a cup of half hot water half white vinegar. This is the part that's supposed to keep the hairs soft for the next time you use it. Let the brush soak again for an hour or so, even over night if you like. Squeeze out as much of the water as you can and let it dry. It should be ready to go for you the next time you are ready to paint. Good luck, and if you have any tips or tricks you would like me to try out. Send me an email.